The latest funding scheme for archery clubs in the UK has been announced by Archery GB. Boost Archery is a scheme designed to help archers access tailored coaching in their clubs, and grants of £350 will be handed out to successful applicants. It aims to help archers improve, to progress and to stay active in archery. It will fund clubs and enable them to deliver a series of coaching sessions to new members or to archers who are simply looking to progress. To apply for the grant, archery clubs must be affiliated to Archery GB and be members of ontarget – Archery GB’s club development programme. If you are not already a member, simply complete this online application form. And if your club has previously received funding from Archery GB, you are still eligible to apply. Funding can cover the purchase of non-personal equipment that is not used just by one person, it can fund the arranging and hiring of coaches, training coaches or volunteers, venue hire, volunteer activities and any further reasonable costs incurred that will enable you to deliver Boost Archery. To apply please complete the application form and email it to nicky.hunt@archerygb.org. The closing date for applications is Wednesday 30 November 2016. Good luck! KUDOS is passionately and actively committed to supporting and encouraging people from all backgrounds and of all ages to get into archery. 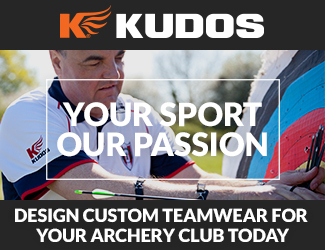 KUDOS are proud to supply custom kit to Archery GB – kit that is built for performance and worn with pride.